The Simple Life of a Queen: And The Heat Is On! It's Tuesday and it's a warm one outside already. I came home from the lake yesterday because I wasn't feeling very well and it was pretty hot anyway. Tonight we're having dinner at a friends house. I had planned to go back to the lake tomorrow and home again Thursday for a cardiologist appointment but since it's so hot we may just wait until the weekend to go back. I took these pictures of these delicate daisies on the road by our trailer. I adore daisies. They seem like such a happy little flower to me. 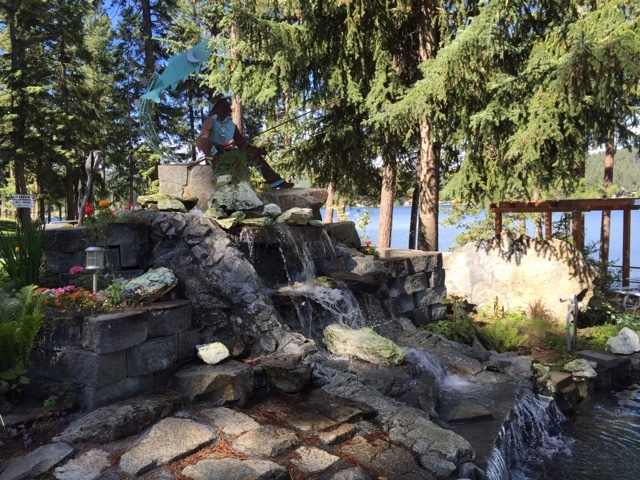 This is the fountain by the store at the resort. They usually turn it on only on the weekends to conserve water, but during June, July and August, it's on most of the time. 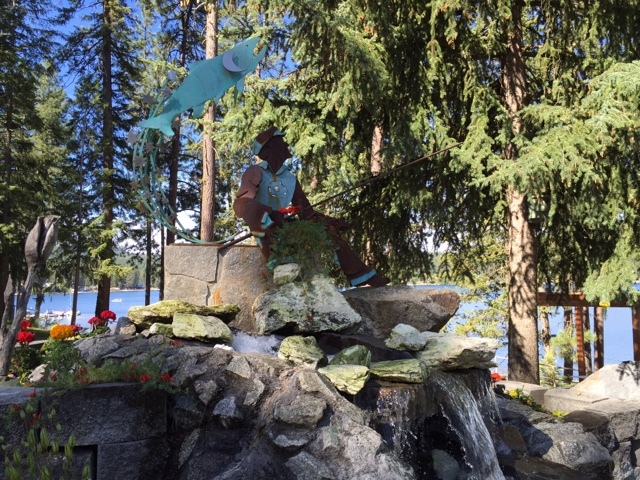 There's a happy fisherman perched on the top catching his dream fish. :-). Loon Lake is very popular with the fishermen and has lots of different species in it. The most popular, (I think), are trout and silvers. I haven't fished since I was a teenager, but lots of people up here do and I cheer them on from the campsite when I see someone pulling a big one out of the water. It was a lazy afternoon on Sunday. 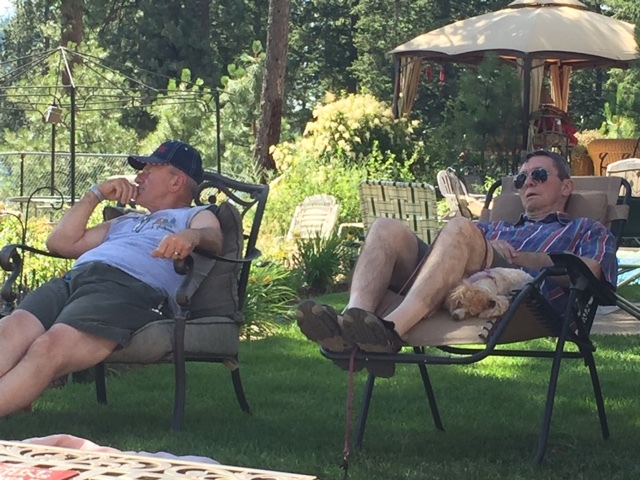 Larry and Dennis both took long naps. Sophie enjoyed sleeping next to Dennis too. We had received a phone call about 8:45 on Saturday morning that a friend needed to go to the ER and didn't want to call an ambulance because of the cost. Dennis drove almost an hour and a half to his house to get him and back into the hospital in Spokane. After staying almost eight hours in the ER with him, he drove him home and back to the lake. It ended up being almost 11 hours for him. He's been so stressed at work that he was really looking forward to a day doing nothing at the lake, but he is such a good guy it would never dawn on him to say no to anyone. So...I made an executive decision and we stayed at the lake Sunday and went to church on the Bay instead of driving back into town. This is how he spent the afternoon and he really needed it. 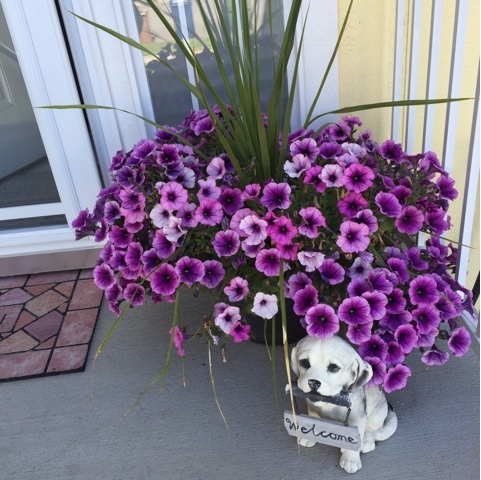 My happy basket of flowers by the front door at a our "city home." 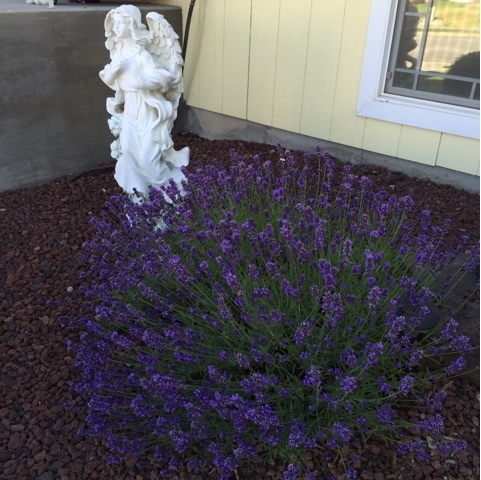 The lavender is blooming profusely. 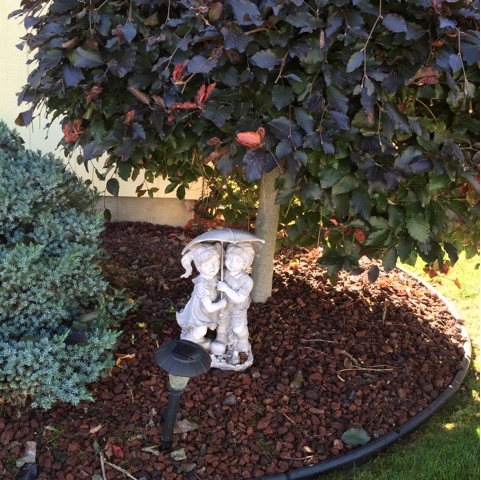 This was my first little statue when we bought the house years ago. I love the happy little children. Nita had a pile of squares for me when I arrived at the trailer on Friday. 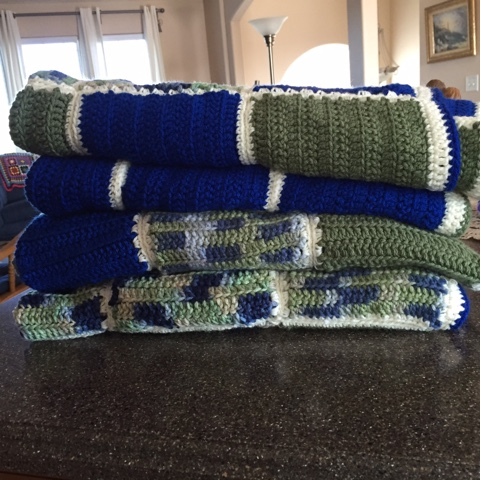 I spent most of the weekend putting these four blankets together and crocheting borders around them. They will be going to the crisis nursery in the near future. Perfect for some little boys, don't you think? 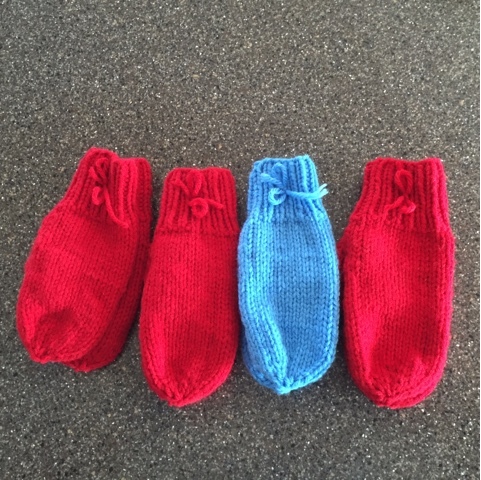 I did finish four more pair of mittens for the school children. And I started a new pair this morning. I have about 20 more pair to make...I think. I haven't counted recently. I finished one of the socks I showed you last week and started the other one but since I spent most of my time on mittens and blankets there isn't much to show you on those. I was watching Tiny Houses last night and all of the sudden the TV switched channels on it's own to some paranormal show and I couldn't do anything with the remote. I figured the batteries must have died, although it's a brand new remote from the cable company, only about 2 months old. They upgraded everything when Alex was home, the box, the remote and the channels too. Apparently we had been paying for the fast speeds etc., and getting the old stuff. Anyway, I couldn't get the battery door off at all. This morning I went into the service center and he said, "the door just pops off. Like this." And then he couldn't get it off either! I wanted to laugh, but I restrained myself. Seriously, he acted like I was fairly stupid and then he couldn't open it either. I admit that I am very technologically handicapped, but I can change batteries. Finally he gave up and handed me a new remote which had to be programmed. Now it works though and I'm a happy girl. It was kind of strange that it worked great and then just stopped. No warning at all. 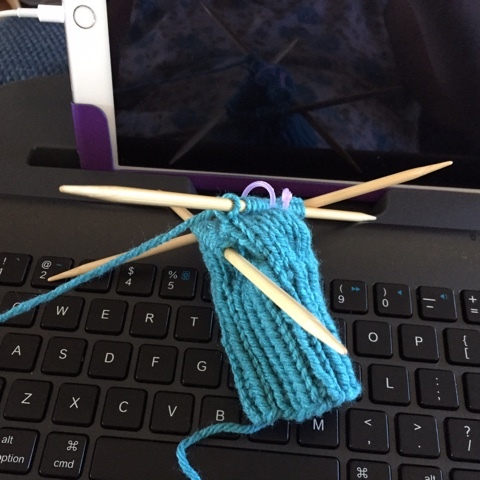 I plan to spend the day knitting mittens in my chair and reading the third book in the Blossom Street series by Debbie Macomber, "Back on Blossom Street". I'm really enjoying rereading this series. It's my third time through them and it's like visiting old friends. I hope you all have wonderful plans for the holiday weekend if you live in the U.S. I'm praying for the people in West Virginia with the terrible flooding. You are blessed with such a thoughtful and generous husband, to help out a friend in that way is amazing. Hope all goes well with you at the cardiologist. The blankets and mittens are such a lovely thing to do. Take care. Ah, yes...it is most definitively summer here too. I've got a big mosquito bite on my arm and lots of other itchies. I'm trying to enjoy it by remembering how cold it's been these past few winters. Seeing the outdoor kitties stretched out on the lawn furniture napping makes my heart happy. 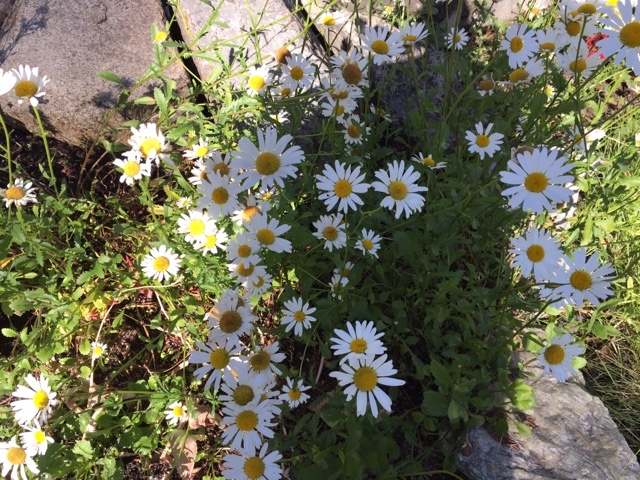 My daisies are blooming here also although there are lots of weeds blocking their view....alas...will I ever catch up? LOL! Poor Dennis, what a good man he is....but he will be no good to anyone if he doesn't take care of himself. Bless him and his good deeds and yours too! I'm sorry, but I think it's horrendous that someone should have to pay for an ambulance to the hospital. Dennis is a saint to help him out -- that was a long trip and a long day. Hope your friend is okay. And hope that you are feeling better. The blankets are awesome. And the mittens so pretty. Bless you! The daisies are so pretty, they are like little smiles of happy. Love them. You have been very busy with your knitting and crocheting. I hope you get to feeling better soon sweet friend. Your Hubby is so nice. What a true blessing he was to your friend. :) Wishing you all a lovely 4th of July sweet friend. :) Blessings always. Hi Betsy. I am so sorry you are not feeling well again. You and Dennis are both such giving people. Always lending help where needed. The world needs a lot more folks like you both!! Take good are, and thanks for sharing the lovely lake pictures. I always look so forward to them! Hi Betsy, hope you are feeling better. What a kind, thoughtful hubby you have! And, it is definitely summer here as well. We have been having the HHH (hazy, hot, humid) weather Philadelphia is known for. I like the longer days, but I'm ready for cooler temps. It was even very warm (80's) up in Maine the other week when we were there! Wow, your husband is truly a great man. People like him -- and you -- are what make the world work. I hope he had enough time relax! Your lake life looks wonderful. A lot like Northern Wisconsin. We've thought about buying a cabin, but so far we just go to the same place every summer. I sure hope your appointment went well Betsy, you have had it by now and I hope you only had good news. Dennis is wonderful but so are you! I love your posts they're always so uplifting and encouraging. Gods beautiful flowers in His garden are magnificent, the physical flowers and the spiritual flowers of good deeds in Jesus' sweet name. How precious are such things in the eyes of the Lord they will receive their reward. We are indeed richly blessed in Him. I love the rich purple petunia patch at your front door, and your rugs. They're gorgeous colours. God bless dear friend, not sure if you've seen cardiologist yet but our omniscient God knows I am praying in any respect for His blessings and grace in the matter. It's a bit toasty out there.